Burglars picked up and threatened to harm a newborn baby if their victims did not tell them where money was hidden. The gang also held knives to the throats of women in the house. 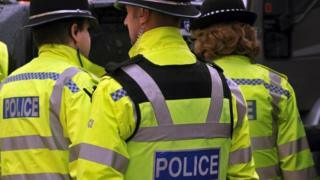 It is one of a series of "nasty burglaries" across Birmingham, police say. They say they are investigating 28 crimes thought to be carried out by "different groups which are not connected to each other". Violence has been used "on a number of occasions", according to the West Midlands force, "with other victims being threatened but not harmed". One victim was hit with a metal bar and others were struck with fists. The burglary involving the baby was in Balsall Heath on 8 November. The front door was forced open and a family was ordered into a bedroom. Burglars have also struck in Alum Rock, Edgbaston, Erdington, Four Oaks, Hall Green, Kitts Green, Small Heath and Winson Green. Police say they are also looking into break-ins in Bordesley Green, Hall Green, Hodge Hill, Moseley, Saltley, Smethwick, Tyseley, Ward End, Washwood Heath and Yardley. A man, 28, has been arrested on suspicion of robbery in connection with a Moseley incident and bailed. Det Insp Dave Keen said: "The spate we have seen recently is a real concern for me and we are doing everything we can to identify the criminals responsible." He said a taskforce was working on the investigation "literally 24 hours a day". Asian families, he said, had been targeted by criminals who "scope areas for homes" in which they thought there was jewellery and gold.